On April 16, 2010, me, Dianne, and my parents went back to Hopkinsville to meet with Dr. Franke, my urologist and surgeon to get the results of the surgery. I was a combination of anxious and nervous as we walked into the office. As we sat in a tiny conference room, Dr. Franke explained to me about what the biopsy showed and what all it meant. I must admit, I didn't understand half of what she was saying, but then she said the word I wasn't wanting to hear, Chemotherapy. As soon as she said that I knew my life was heading for a radical change. Dr. Franke said that this was going to be our last visit together and that she was referring me to the local oncologist across the street (at the hospital) to further assess my case. She assured me that they were very good doctors and that I would be in good hands. So I left with an appointment card to meet with an oncologist on April 30. I know had 14 days to relax before meeting with the doctors, so I thought. On Saturday afternoon I got a call from my dad telling me he thought I should go ahead and finish the semester. I was kinda blown away. I had already stopped thinking about school for about a week and packed my books away (I was moving out of my apartment in May). Honestly, I had just planned on playing golf while I still could and hang out with my friends until I moved back home. I was almost arguing with him on the phone why I shouldn't finish school and how I was so far behind. But, by the end of the conversation, I was going to try and finish out the semester. So I unpacked my books, made a list of everything that I had to make up, saddled up and got myself caught back up. On April 30 it was back to Hopkinsville to meet with Dr. Gajera, my oncologist. When we walked into the office, I was looking around at the different people who just looked sick. They almost had a blank stare about them as they waited for their name to be called. I was thinking to myself how long it was going to take before I started looking sick? How long before my hair fell out? Would it all fall out at once, or was it a process? I was soon going to find out. They called my name and we were taken back to a sterile pink-walled exam room. Hung on the walls were posters of different types cancers and how they affect the body. After about 20 minutes the doctor came in and sat down. He discussed with me exactly what was going on with my body. He talked about testicular cancer treatment and how technology has come a long way and that testicular cancer is very predictable. Therefore, the treatment has been honed in to almost an exact science on how to cure it. The chemotherapy was going to be a 12 week process treated with BEP, which is Bleomycin, Etoposide, and Cisplatin. The 12 weeks would be split into four, three-week cycles. A cycle would consist of 1 week in the hospital receiving treatment for five days. Then each Monday the next two weeks, I would stop by the hospital for an outpatient treatment of Bleomycin. But, he said since I was young and the Bleo was hard on the lungs, he would only do the bleomycin for the first cycle (3 weeks). He also said he wanted me to get a port for the chemo. I had no clue what he was talking about. He informed me that a port was a device that was implanted in my chest, accessed by IV in order to administer the chemotherapy. 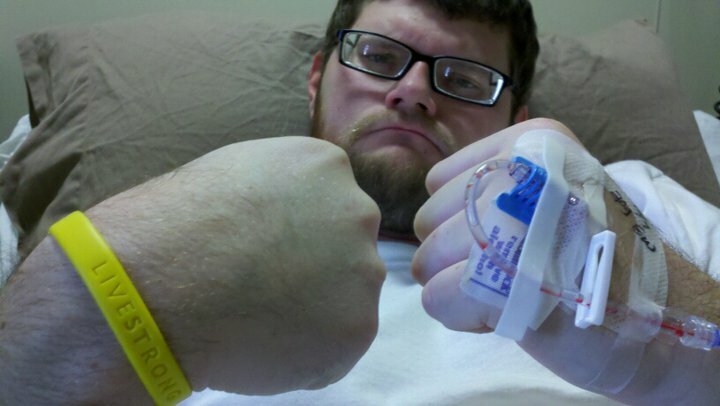 He explained that the chemotherapy would be hard on my veins, and that the port was the easiest way to go through chemo. So, I left the doctors office with two appointments. I was getting my port placed on May 4 and starting chemotherapy May 9. Hang in there, Paul! My son's kidneys failed years ago due to a rare kidney disease. Thank God for dialysis! He is doing fine. You're young and strong, keep on fighting.